CULVER CITY, Calif., August 12, 2013 – Cody Simpson’s new single “La Da Dee” will be heard as the end credits song in Sony Pictures Animation’s Cloudy with a Chance of Meatballs 2, it was announced today by Lia Vollack, president of Worldwide Music for Sony Pictures. Simpson will also be shooting a music video that will incorporate footage from the film. Written by Keinan Warsame, Wayne Wilkins, Antwoine Collins, Cody Simpson, Roman Ramirez, Kevin Anyaeji and Rich King, and produced by Wayne Wilkins, “La Da Dee,” from Atlantic Records, is on sale now. The song is now available for purchase/download on itunes. 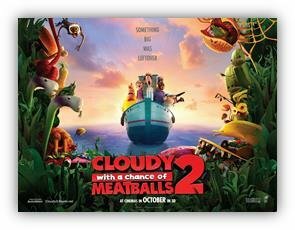 Cloudy with a Chance of Meatballs 2 picks up where Sony Pictures Animation’s mouth-watering comedy left off. Inventor Flint Lockwood thought he saved the world when he destroyed his most infamous invention -- a machine that turned water into food causing cheeseburger rain and spaghetti tornadoes. But Flint soon learns that his invention survived and is now creating food-animals – "foodimals!" Flint and his friends embark on a dangerously delicious mission to battle hungry tacodiles, shrimpanzees, hippotatomuses, cheespiders and other foodimals to save the world – again! Directed by Cody Cameron and Kris Pearn. Screenplay by Erica Rivinoja and John Francis Daley & Jonathan Goldstein. Story by Phil Lord & Christopher Miller and Erica Rivinoja. Inspired by the book Cloudy with a Chance of Meatballs written by Judi Barrett and illustrated by Ron Barrett. Produced by Pam Marsden and Kirk Bodyfelt.